I had my timing chain and water pump replaced and I got maybe 1000 miles down the road and my belt shredded. I put a new belt on and noticed that its walking up the edge of the crank pulley. I tried replacing the tensioner/tensioner pulley but it didn't help. I think the crank pullley somehow got put back on wrong? Anybody know how I can adjust the alignment or if its even adjustable? 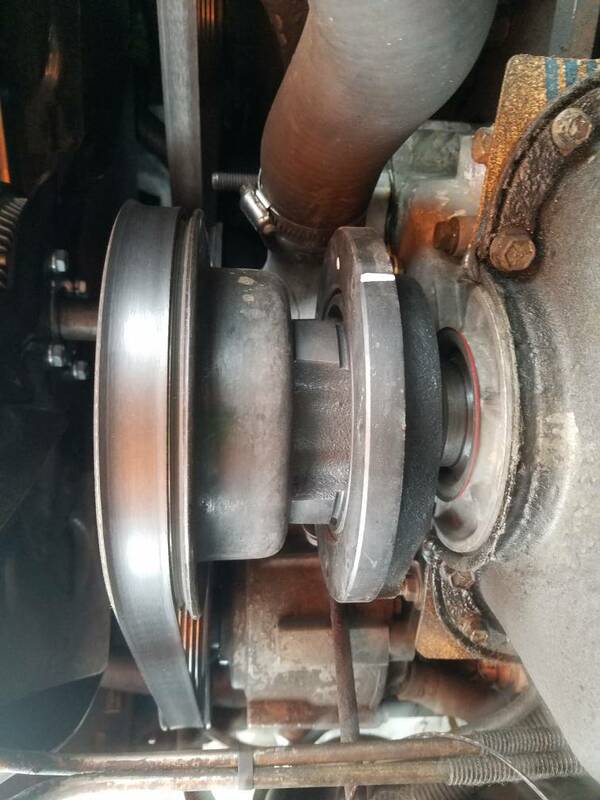 Looks like the crank pulley wasn't sucked in far enough? Unless you sleeved the balancer, it does appear to be farther out than it was before. The clean area on the seal area looksto be a ways out from the seal.Also seems like the pulley alignment is off. However, the way the belt runs seems you are too far in. Like the harmonic balancer wasn't fully pressed on? Can't over press, only under press. It was only an observation based on pics, which unfortunately aren't always as good as seeing it personally. So somehow the bracket for the smog pump is missing making the pulley all catiwompus . Anybody have one laying around? Not having a lot of luck finding one. I think the mechanic who did my timing chain lost it and never put it back on there. Either that or it straight up fell off (doubt it!) I know one of you deleted yours and you dont need it! Probably a local wrecking yard! check the center of your p/s pulley. the shaft of the pump should be flush with the pulley. if not, the belt will "walk" its way up the pulley groove.